My clients stayed at Tradewinds Island Grand Resort for several days this summer and I had a great time capturing their portraits, especially of the age range of their children. The youngest at 9 months amazed me with his love of playing in the sand! I really like the black, cream and tan clothing that they wore to their sunset portrait session. Black works well at the beach since it looks good, even when wet and I really like the ladies dresses. Summer has arrived in Treasure Island and St Pete Beach Florida and the sunsets can be amazing this time of year. Our clients were two families vacationing together and they hires us to capture some great beach portraits. The summer rain created some nice overcast skies and for the actual sunset the clouds helped create some unbelievable colors in the sky! I really like how their outfits pop from the sand and grasses, and later at sunset the Corals, Whites and Pinks they wore coordinated beautifully with the sunset skies. May was the month of adorable toddlers and babies and this little girl was so sweet! We had a great time photographing this adorable family at Tradewinds Island Grand Resort and the Guy Harvey Outpost over Memorial Day weekend. She was the sweetest little girl; almost walking, with the warmest smile! We had fun meandering around the beach areas of both resorts and the sunset was beautiful. The icing on the cake at this family beach session was a nice fireworks display presented by Tradewinds Resort in celebration of the holiday. A grande finale that was a pleasant surprise. My clients came to St Pete Beach for a vacation at Tradewinds Island Grand Resort and scheduled a family beach portrait session. After viewing our Portfolio of beach session locations, they decided on a session at Treasure Island Beach. This particular night had amazing diffused natural light and a pretty soft sunset which allowed their outfits of Navy, Nantucket Red and Nautical stripes visually pop from the beach environment. Their son was beyond adorable; a perfect 18 month model! 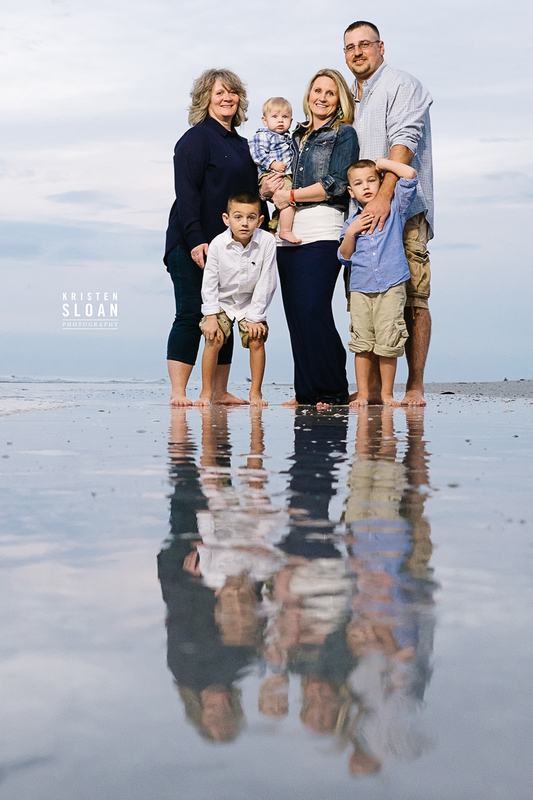 What I love about this recent family session are the attire colors selected by my clients who were vacationing at TradeWinds Island Resort in St Pete Beach, Florida. Their clothing selections for their family beach portrait session look great against the lovely crisp blue skies and white sand. The whites and creams, various shades of blue and the pop of magenta really work at the beach. Plus most everyone owns a pair of jeans and the little boys navy pants and shorts add another tone of blue. One of my favorite aspects of being a portrait and wedding photographer is presenting to the client a custom photo album. With every portrait session I include a 6×6 square mini album which is printed on Kodak Endura Professional paper. This album features some of my favorite images from the client’s portrait session printed in seamless 6×12 spreads. Today I am mailing three Treasure Island, St Pete Beach Portrait Sessions which we recently photographed. Additional exact copies of the album make great gifts, especially around the holidays. In this modern age of digital photography, I feel it is very important to print photographs and these books are a great way for my clients to share their Kristen Sloan Photography Portrait Session images with family and friends. This modern photo album is the perfect size to throw into a purse or bag. I personally custom design the photo layout for each album to match the look and feel of the portrait session. The Kodak Endura Photographic Paper used in printing these mini albums is the same photo paper which I offer my client’s in their online portrait photo galleries.